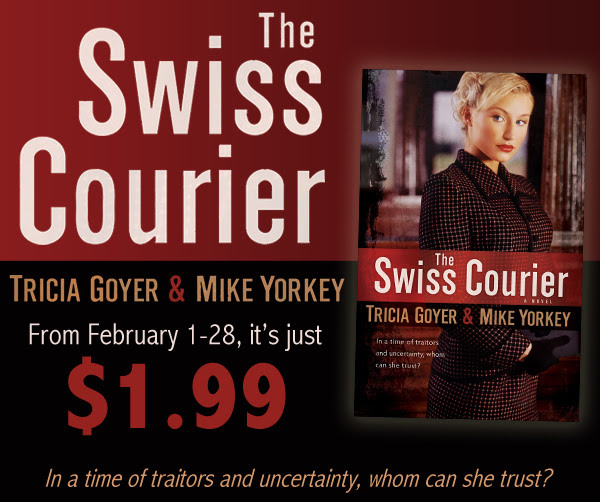 If you haven’t yet heard, The Monuments Men movie released this past weekend—just in time to coincide with my Monuments Men-era book The Swiss Courier going on sale for $1.99! Last night, Eric and I got a chance to watch The Monuments Men on opening night. This is a movie I have anticipated since learning George Clooney was in production in the fall of 2012. That’s a long time to anticipate the movie! This movie captures the tone of The Monuments Men. It grasps what this small group of men was trying to do and honors their memories. It also communicates their sacrifice and devotion. It visually portrays a piece of what was at stake during WWII — and the balancing act. Yet it did this without becoming dark and maudlin. Eric and I saw the 9:15 p.m. showing — in a theater filled primarily with college students — students who laughed out loud multiple times. The humor never detracted, but in enhanced the movie because it didn’t become slap-stick. The Monuments Men has an A cast: Matt Damon, George Clooney, Bill Murray, John Goodman, Cate Blanchett, Hugh Boneville and more. They all fell into their characters and became the Monuments Men they portrayed. The movie is a war movie, but the violence is limited and at a level I can take my 13 and 10 year-olds to see. There was some language, but not heavy . . . I didn’t count, but it wasn’t a distraction. There is also only mild innuendo and the outcome to that was PERFECT. I literally bounced in my chair because it mirrored history! There were a couple twists to the story. Nothing major — the key one being the kid who interpreted didn’t show up as early as they portrayed, but he did play a role later in the process. This is a movie I will see again — and enjoy. Enter Today | 2/10 – 2/23! Do you also want to see The Monuments Men movie? Cara is giving away 10 pairs of tickets to see the movie, and to accompany the tickets, she’ll also be giving away copies of her new book based in the same era, Shadowed by Grace! Enter to win using the widget below. AHHHH!!!! I want to win!!!!!!!!! thanks for the opportunity for a chance to win the book, Shadowed by Grace, and to sign up for Cara’s newsletter. I love to read about the authors that I read. Thanks Tricia and Cara. How will I get the tickets? Received the book and will start reading tonight 🙂 THANKS!